In case you haven’t, he’s a lovely fellow. I ran into him at the cafe in my office. It’s a fancy cafe, serving things like duck confit on a regular Tuesday. Farro and I got to the line at the same time and did that little awkward dance: you go first, no after you, well thank you. We struck up a conversation. He speaks with a slight Italian accent and if you lean real close, you might pick up a Middle Eastern lilt. When I asked where he was from, he proudly traced his roots back to the Fertile Crescent. He spoke like a DAR whose family fought in the American Revolution and came over on the Mayflower. We sat down together with a group of colleagues, and the subject turned to dating. Farro was having a rough time of it. He had only recently moved to Boston and didn’t know where to meet people. So I invited him to shabbat dinner. I thought he might really get along with my friend Tabouli. Tabouli’s family is also from the Fertile Cresent area and her parents moved to the US from Syria and Lebanon by way of Israel. Her best friend is Parsley and she often hangs out with Cucumber, Tomato, Scallion, and Mint. They used to go to mixers together, when mixers were the place to be seen, and picked up Lemon and Olive Oil, welcoming them into their crew. Tabouli had been in a bit of a funk after she and her boyfriend Bulghur broke up. He was a bit of a bully and she needs someone more soft and inviting. I was thrilled to play matchmaker. I didn’t tell either of them about the other. I wanted to see how they would get along at dinner. They sat next to each other. So far, so good. Farro’s hand grazed against Tabouli’s arm when he reached for the water pitcher. Tabouli giggled. She batted her long eyelashes. Farro shared his nutty sense of humor with jokes that Tabouli laughed at while the rest of us forced grins. So far, so very good. After dessert was served and tea was drunk, Farro offered to walk Tabouli home. She demurred, saying she was going in the opposite direction. In the end, she relented. Weeks and months passed in their whirlwind romance and I wasn’t surprised to quickly see a ring on Tabouli’s finger. They moved away to the West coast and bought a house. A year later, they returned to Cambridge – Farro was interviewing for a job. I again invited them to dinner. As the summer sun set, they arrived with a sleeping bundle. She was beautiful with a shock of light blown hair and long eyelashes and cherry tomato cheeks. She wore a green onesie that Aunt Parsley gave her. She was so cute, I could just eat her up! Farro is s a nutty whole grain that is chewy and firm. 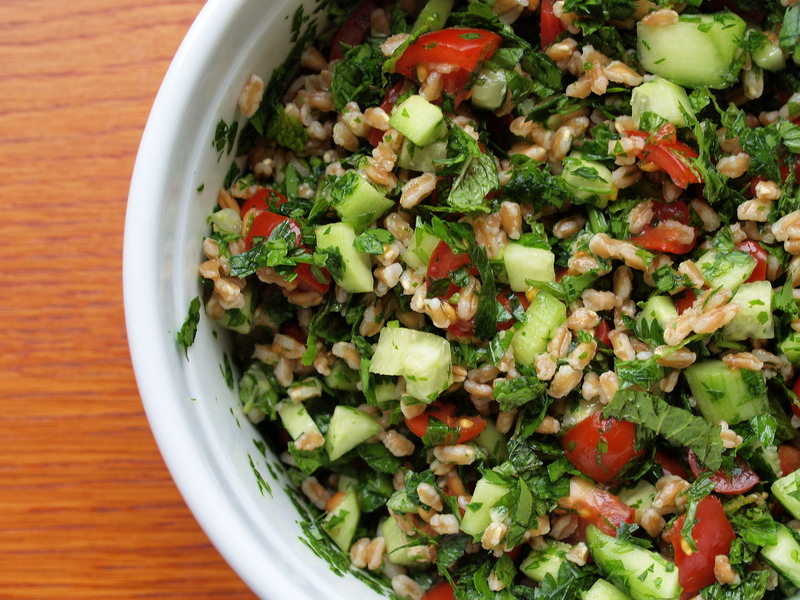 It absorbs the flavors around it and is the perfect base for tabouli – a Middle Eastern salad whose star is pasley, providing a bit more bite and substance than more traditional bulghur. I based this recipe on one in Food & Wine and another provided by Anson Mills, a retailer of heirloom grains. If you want more farro ideas, check out a recent article in Saveur written by Leah Koenig (who wrote a cookbook that included a few of my own recipes). This recipe makes enough for 4-6 as a side dish and would be great for Passover with quinoa. Cook. Prepare the farro according to package. Most directions call for a quick rinse before cooking, and some suggest pre-soaking. Don’t overcook the farro or it will get mushy. I usually remove the farro from the heat a few minutes shy of the time recommended time. The grains will soak up additional liquid from the rest of the ingredients. Cut. Chop the tomatoes and cucumbers into small cubes (1/4 – 1/3 inch per side, but don’t worry about being exact). Thinly slice the white and light green parts of the scallions. Finely chop the parsley (removing any tough stems) and mint leaves. Squeeze. Juice the lemons, making sure to strain out the seeds. I usually squeeze each lemon half over my hand and catch the seeds as they fall. Mix. Mix in a large bowl the farro, vegetables, and herbs. Season with lemon juice, olive oil, and salt and pepper, tasting as you go. No, I didn’t bring them back from Italy, though that would have been the type of story I like to tell. I could tell you about how I visited Rimini with my friend Lau for a beach holiday. How I ran to dip my feet in the Adriatic before we had even started to unpack. How as I walked back to the room, flip-flops in hand, I stopped by a little gelato place, drawn by the scruffy man behind the counter wielding a shallow scoop, caught by the indecision over gianduia versus espresso, satisfied by a double cone, and enchanted by the large jars holding nuts and tiny chocolate chips. How I inquired about those jars and was told that they had been made for the past 150 years by a company only three hours away in Fidenza that began its business making bottles for pharmaceuticals. How I rushed back to my room to find Lau resting on her bed, arm flug across her eyes to block out the ray of sunlight, and how I woke her up to taste that gelato and tell her my plan of renting a car to drive those three hours to the glass manufacturer to see a little history. How I said, “it’s only a three hour drive” with such conviction that she forewent a day on the beach to accompany me. I could tell you about how I visited Venice with my college boyfriend and how after a morning of navigating the canals and pigeons, we took a speed boat out to Murano to see their famous glass. How when ringing up a small decorative plate, the store owner stuffed her copy of the receipt into a glass jar. How I was so enamored by the jar that she emptied it, as she said she did every night, and arranged all the receipts in a neat pile, and handed the jar to me. I could tell you how I was just south of Naples on the island of Capri in the cold of November with a friend who was a serious shopper. How she introduced me to Prada and Gucci. How our little hotel in the cliffs welcomed us to our room with a glass jar filled with biscotti in lieu of a TV. How we took that jar of biscotti with us as we hiked out to the blue grotto (“La Grotta Azzurra”) and snacked on them along the way, holding on to the empty jar as we scooched down in our tiny rowboat to enter the water-filled cave. And how I carefully wrapped that jar in t-shirts to secure its safe flight home. I found the jars in a store not too far from my apartment and I picked up one from the shelf. I went back to the shelf. I brought home five. The other stories are better, no? Regardless of how I got them, now I get to fill them. 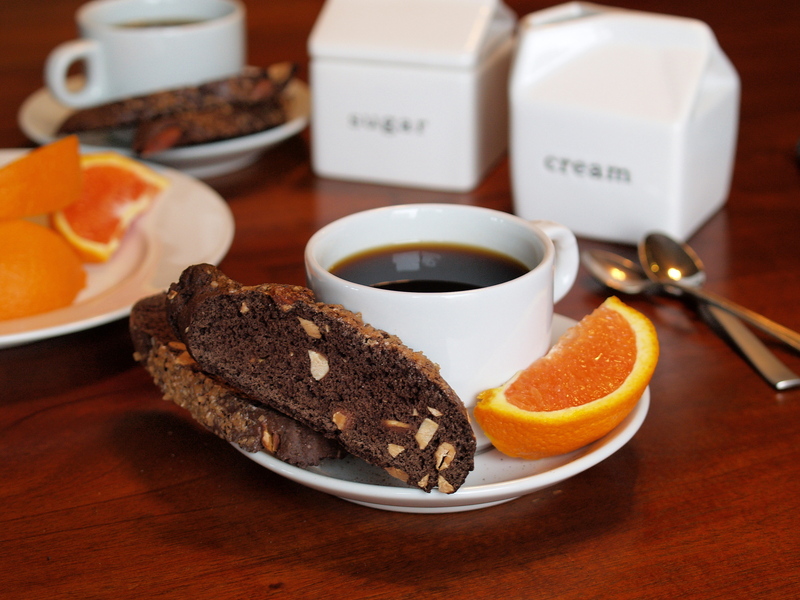 Let’s start with the biscotti that my Capri hotel make-believe baked for us. Let’s bake them with cocoa and stud them with almonds. Now let’s tinge them with orange – a little zest, a little blossom water, the smell of citrus. Perfect for a hike (with espresso in a thermos). Next, let’s fill another jar with some chocolate and nuts reminiscent of the toppings in the gelato shop with the cute scoop-wielding Italian man who served me two flavors. Let’s make a nutty crunchy sweet concoction that’s less trail-worthy and more I-need-an-afternoon-snack-worthy. 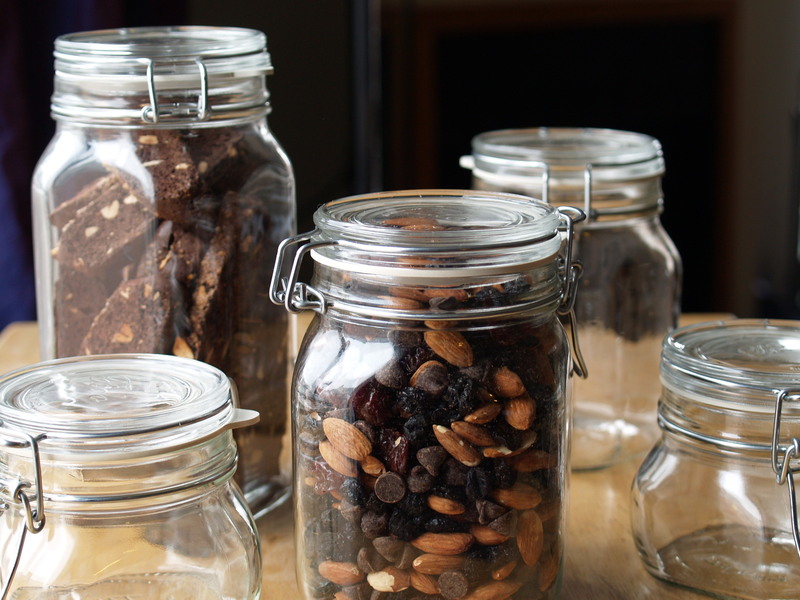 Let’s bring in a jar to the office and leave it on the corner of a desk for everyone to snack from. Finally, let’s fill a jar with receipts. OK, that doesn’t make sense. But let’s say that I open my own restaurant (the one with the long communal table). And let’s say I keep each day’s receipts in a glass jar at the front of the house and keep a stock of glass jars in the back. And let’s say that if someone comments on the receipt jar, I’ll pull one out from that back room and send him away with a smile. 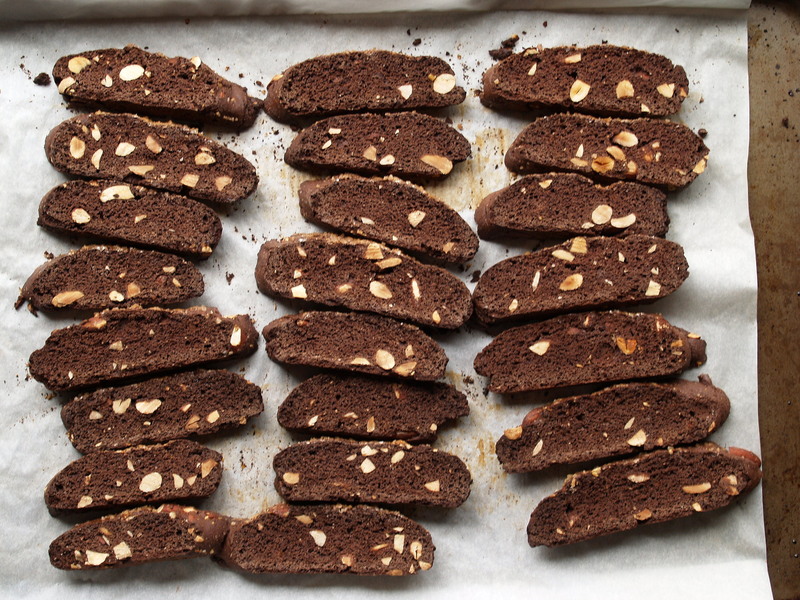 I based this recipe off of David Lebovitz‘s chocolate biscotti – he makes one hell of a biscotti. 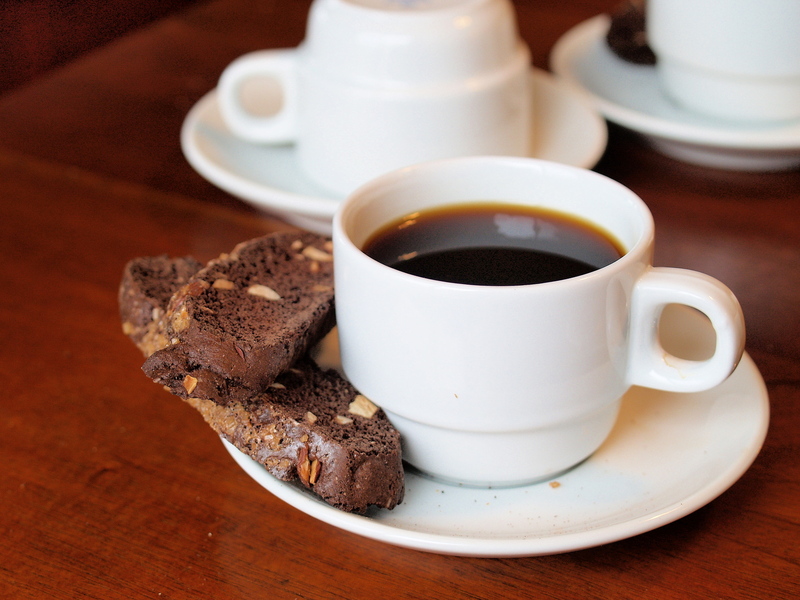 I think these are my favorite biscotti I’ve ever made, and I’ve made a lot. I did make a few changes to give them an orange flavor – I replaced the almond extract with orange blossom water, omitted the chocolate chips, increased the amount of salt, and added orange zest. It’s actually easier to make these by hand than using a stand mixer. Toast. While pre-heating the oven to 350°F, toast the almonds on a cookie sheet. This should take about 10 minutes. 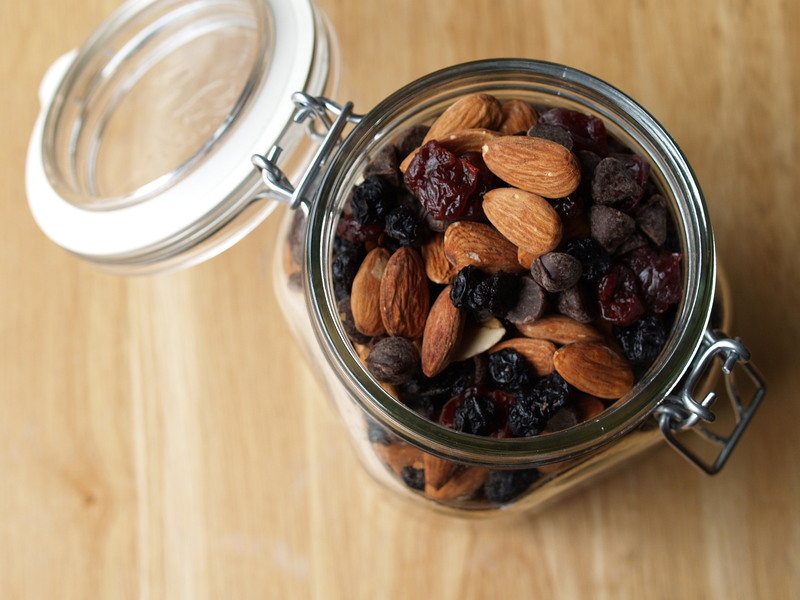 Stay close to the oven – when the scent of almond fills the kitchen, take them out. Let them cool and then roughly chop them. Beat. In a bowl, beat together the first 3 eggs, sugar, vanilla, orange blossom water, and orange zest. Stir. Sift together the flour, cocoa powder, baking soda, and salt and gradually stir into the wet ingredients until the dough comes together. Mix in the chopped toasted almonds. The dough will be thick and sticky. Shape. Line a cookie sheet with parchment paper. Flour your hands a tiny bit and shape the dough into two logs. Lightly brush them with beaten egg white (freeze the yolk for the next time you want to make pâte sucrée) and sprinkle with turbinado sugar. Bake. Bake for 25 minutes until the dough feels firm to the touch. Cool. Remove the logs and cool on a rack for about 15 minutes. Slice. Use a sharp serrated knife to cut the cooled logs diagonally into 1/2-inch slices. Bake again. Lay the cookies, cut side down, back on the cookie sheet and bake for 20-30 minutes, flipping them over after 10 minutes to toast both sides. Eat (or store). In case you don’t finish these all in one sitting, store them in an airtight container for up to two weeks. As if! 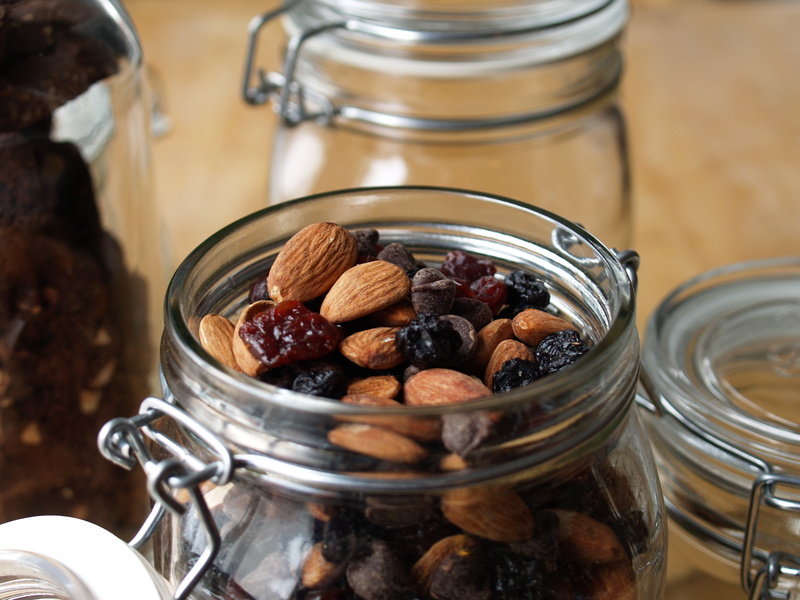 Start with a few handfuls of lightly salted roasted almonds. Bonus points if you then toast them again in your oven until your kitchen smells like almonds. Put them in a big bag. Add in a few handfuls of semi-sweet chocolate chips. Add in one big handful of dried blueberries. Add in one big handful of dried tart cherries. Shake it all around. Pour into an Italian jar. Leave on the corner of your desk.